Set on a 65-hectare park with a lake, this 12th-century abbey offers free access to the on-site tennis court and outdoor swimming pool. Rochefort Golf Club is located 12 km away. Guest rooms have a refined decoration with antique furnishings. Free Wi-Fi access and a view of the park is offered in each room, and some also feature a spa bath in the bedroom. A sauna, hammam and a hot tub also feature at this 4-star hotel, and the building is serviced by a lift. 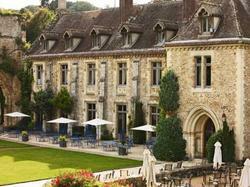 Saint-Rémy-les-Chevreuse RER Station is 11 km from this hotel and Rambouillet is a 12-minute drive away. Motorway A10 exit les Ulis towards Limours then Cernay. Airport : Orly 35km Roissy 80km. Spacious en suite room with a view of the garden or pond. En suite room with a view of the garden or pond. This room can not accommodate an extra bed.